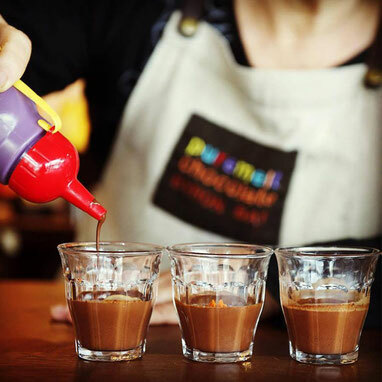 Sarah spent years travelling to farmers markets, gourmet food shows and health festivals up and down the East Coast of Australia, putting products in the mouths of tens of thousands of willing ‘tasters’ - doing the best possible real market research before recently opening her all-organic Puremelt Chocolate Lounge. 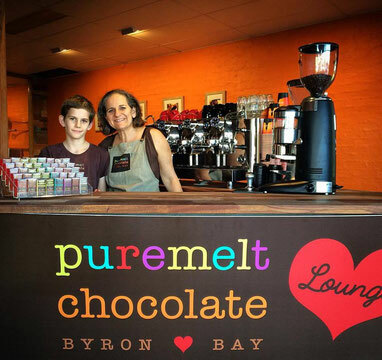 Hidden in the Byron Shire hinterland, is Mullumbimby, affectionately known as ‘the biggest little town in Australia’ and right in the heart of town is her chocolate lounge and the place where all the magic happens. “Its a dream come true” says mother of three and puremelt founder Sarah Wheeler. There’s a reason Puremelt Chocolate’s gluten-free brownies taste so good and it’s not just the generous helping of actual Puremelt Chocolate that goes into them. It’s probably not the organic dairy butter either although it surely does assist. Could it be the organic hazelnuts, almonds and shredded coconut in every bite? Possibly. Perhaps, it’s something to do with the complete absence of cane sugar. No one knows for sure. 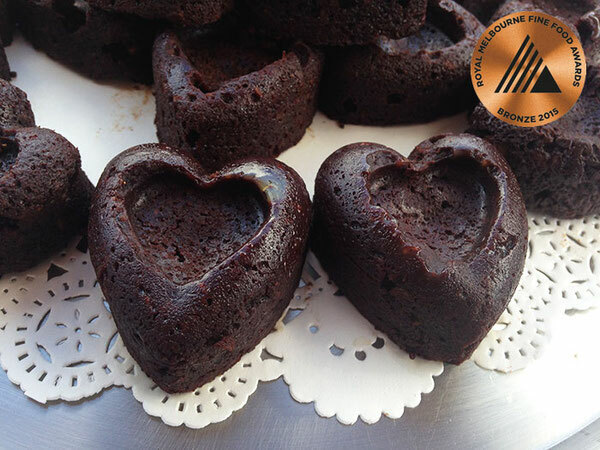 What we do know is that these are award winning brownies that taste fantastic. 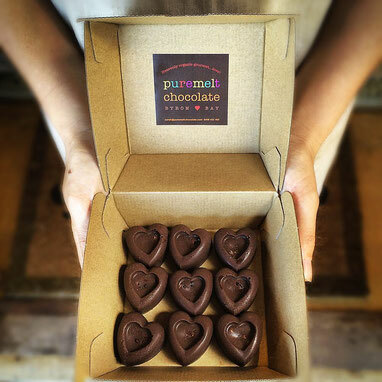 The world’s best organic ingredients are lovingly blended together and baked into beautiful individual heart shaped brownies that are sure to steal your heart once you’ve had a bite. We painstakingly and lovingly select nothing but the best quality, raw, organic, fair trade ingredients that nature has to offer. Do you have a ‘pep-up’ of choice when needing a dose of euphoria, or before a night out? I’m sure lots of substances come to mind, but did chocolate feature on your list? A new trend, coming out of Europe, is using cacao, the base ingredient in chocolate, as a pep-up. Entire dance parties are now reportedly fuelled on cacao. 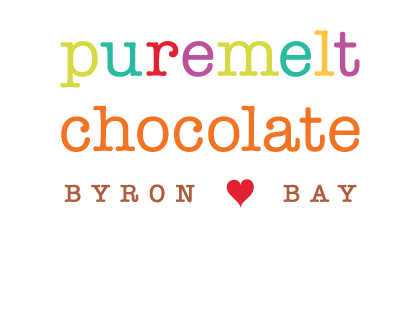 Thanks to Puremelt Chocolate, Mullumbimby’s Chocolate Lounge, it’s available for you to try! Sarah’s Elixir Shots are simply delicious! Served looking like a generous shot of espresso coffee, the base of the drink is Sarah’s house-made cacao syrup blended with a host of spices: cardamon, cinnamon, ginger, vanilla, black pepper, oil of orange and coconut nectar. ‘We add the nectar as it is simply too bitter without it,’ says Sarah. Only a small amount is used and there is no way the shot would be described as sweet. “The way I describe it is warming, both temperature- and taste-wise”. The shot is served warm and the spices create a flavourful hit followed by lingering warmth. The cardamom, cinnamon and orange are the dominant notes. Optional extras are cayenne (for those who like additional warmth), and coconut milk (served on the side, it's the best way we know to get the last drops of elixir out of the glass). A cacao elixir shot is perfect as a simple winter warmer, for a pep-up before a night out, or simply if you want to try a European trend without the airfare. Feel energized and uplifted as the cacao molecules go to work assisting your body in releasing endorphins and serotonin in the most healthy way.